In 1-quart heavy saucepan, cook butter, whipping cream and brown sugar over low heat, stirring occasionally, just until butter is melted. Pour into 13x9-inch pan. Sprinkle with pecans; top with sliced apples. In large bowl, beat cake mix, water, oil, eggs and apple pie spice with electric mixer on low speed until moistened. Bake 40 to 45 minutes or until toothpick inserted near center comes out clean. Loosen sides of cake from pan. Place heatproof serving platter upside down on pan; carefully turn platter and pan over. Let pan remain over cake about 1 minute so caramel can drizzle over cake. In small bowl, mix frosting and whipped topping. 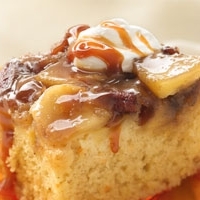 Serve warm cake topped with frosting mixture and drizzled with caramel topping. LET ME SLAP 5 ON THIS RECIPE! DAMN THIS RECIPE SOUNDS GREEEEEEEEEAT! THIS SUNDAY DURING FOOTBALL I'LL PUT IT TO THE TEST! THANKS!